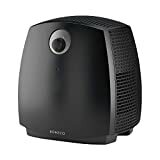 Boneco - 2055A: Humidifier Review • The Air Geeks, reviews of air conditioners, dehumidifiers and air purifiers. A cool breeze in a slightly warm afternoon can be so refreshing that one only wishes it would last forever. This kind of an atmosphere does not only make your body feel good but also unclogs your mind, as it sweeps the stress and the worries away. Additionally, a friendly weather with well-regulated moisture is also good for your respiratory system. This is because unlike dry heated air, perfectly humidified air curbs throat itchiness eases sinuses as well as colds and some allergies. However, weather conditions are subject to change, and this cool and perfect breeze may not last for as long as one may wish for. In this case, to continue enjoying this kind of atmosphere, a humidifier, air purifier, fans or even a heating system might have to feature in your budget. While some of these appliances may appear to be a bit expensive, having an appliance that can serve more than one purpose can be a great idea. One such appliance is the Boneco 2055A, which serves as both a humidifier and an air purifier. One beautiful feature of the Boneco 2055Ais its dual functionality. While most humidifiers only serve the humidification purpose, this one happens to come with an extra function which is washing your room’s air. Rather than having some humidified dirty air, Boneco 2055A leaves you with pollen free, dust-free, pathogen-free, odorless air that is perfectly humidified, making your room a perfect place for small children, and those with allergic problems. To make the already purified air even better, the Boneco 2055A comes with an integrated essential oils fragrance container, which leaves your room smelling great. To do this, all you need is to sprinkle a piece of cotton with essential oil and place it in the fragrance container. The Boneco 2055A humidifier discs normally do have a high adhesion for water, which allows a high output humidification. This is enough to serve a room of up to 600 feet squared in 24 hours. The humidification discs require no replacements. They are rinsed naturally, as they rotate upon the water. This humidifier has a water capacity of 3 gallons and in case the water is depleted, the humidifier automatically shuts off. The water tank is transparent and removable. The Swiss engineering technology used to design this humidifier has ensured that its operation is very quiet, thus very suitable to use even at night. Moreover, this humidifier is easy to clean and easy to use. It consumes very little energy, of 20 Watts and 120 Volts and weighs 5.9 kg when empty. This beautiful humidifier bears a cuboid shape with a length, height, and width of 36 cm. It has a 10 years warranty and comes with a clear and elaborative user manual. The Boneco 2055A humidifier and air washer are fitted with special humidifier discs. When the humidifier is turned on, air particles are charged by the pre-ionizer. These particles collect together dust clusters which stick on the humidifier discs. As the discs rotate upon the water, the dirt and other contaminant stuck in the discs and present in the air are removed, naturally. Endurance: Does not require replacement of the filter and its components are strong and long-lasting. Operation: It is easy to operate and clean. Maintenance: Its air inlet grid is removable. My husband has severe allergies. He has used this brand and model of air cleaner for a long time. It helps keep the air in our bedroom in good shape and his allergies bother him less with it running. We even take it with us when we visit our families. He does have to clean it regularly to keep the scum and/or mold down. This would be true of any appliance of this type. Just be aware of that before you buy. " The air washer/humidifier itself works beautifully; however, the design of the water reservoir is absolutely ridiculous! It is so small that I have to fill it twice a day and I keep the device set on "low". In addition to the reservoir being so small, it is extremely difficult to fit in the sink and to fit the faucet over the opening; I can't imagine how you would do it if you had a fixed faucet; I have enough problem with a pull-out hose type faucet. " For a sizeable office or room, the Boneco 2055A air washer and Humidifier is quite good. While it cleans and humidifiers your air, it’s also possible to have the humidified air scented. Its maintenance seems quite easy considering that it needs no part replacement. However, the small water reservoir calls for more refilling, probably three or more times per day. While refilling by itself is boring, the filling process itself is a pain due to its small placement opening. Nevertheless, one can always get a way of handling these issues and concentrate on the good side of this humidifier. You can purchase it and see how it works for you.